Two years ago Werrington Jogger Anthony Johnson would have struggled to make the top 50 in local road races. Since then the talented 26 year-old has made giant strides forward, and recorded his first ever race win in Sunday’s March Spud Run, seeing off some classy opposition in the process. Johnson achieved this less than 24 hours after impressing in a track 3,000m race in the colours of his second claim club Nene Valley Harriers. The race was held on the same five-mile mixed terrain course that March AC used for their Frostbite League race in January. However, the conditions could not have provided more of a contrast as the winter quagmire had turned into a hard-baked surface designed for quick running. Among Johnson’s opponents were Thorney 10k champion Matt Pyatt and Paul Vernon, who had already tasted victory on the course this year as part of his Frostbite League clean sweep. As expected, the speedy trio dominated proceedings, and the hard training that Johnson has been putting in paid off as he seemed to grow in strength as the race went on, pulling away from runner-up Vernon, and winning in a time of 26:38. That gave him a victory margin of 22 seconds over Vernon with Pyatt a further minute down in third place. In the ladies race Nene Valley’s Philippa Taylor returned to winning ways, after a rare defeat at the Ramsey 10k the previous weekend. Taylor was the first lady home in a time of 31.03. Lisa Marriott of Ramsey Road runners was second while another Harrier, Ruth Jones, finished third. The Eye Charity 5 mile race was held on Thursday evening at Lindisfarne Road. 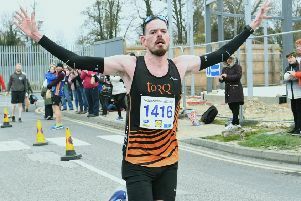 James Mogridge of Yaxley Runners took the honours completing the course in 28.01, with second-placed Daniel Snipe of Peterborough AC trailing Mogridge by 13 seconds. Shaun Walton of Ramsey Road Runners completed the top three. For host club Eye Community Runners, Ben Heron was first over the line in a time of 29.47. The first lady home was Nene Valley Harriers prolific road racer Louise Blake who crossed the line in 35:34 ahead of Laura Conway and Lisa Maloney, both of whom were running in the colours of Eye Community Runners. The race raised £930 for the Guide Dogs for the Blind.